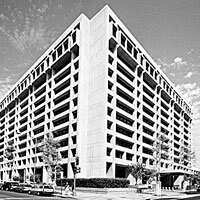 Positive appraisal: International Monetary Fund headquarters. IMF’s Global Financial Stability report was released on Monday. Even as the ministry of finance is considering more selective controls to stem the tide of capital flows into India, a new report by the International Monetary Fund (IMF) says that the economy’s strong performance is leading many global investors to enter the domestic markets through an increasing number of channels, including financial derivatives. India has several restrictions on direct capital flows, even though it allows limited foreign direct investment, or portfolio investment, in companies. Foreign investors still cannot participate in the inter-bank currency market and are not allowed to speculate in local currency directly. Also, there are other roadblocks in the form of taxes—including withholding tax—apart from procedural bottlenecks. Still, recent liberalization and high economic growth have resulted in gross flows rising more than five times from $20 billion (Rs79,600 crore) a quarter to over $100 billion a quarter. Dharmakirti Joshi, principal economist with domestic rating agency Crisil Ltd, agrees that “there are many ways to sidestep capital controls, and PE has definitely been the most popular one, though it has been concentrated mainly in small and medium companies." Real estate is one area where the returns are extremely high, and in the past couple of years, the Reserve Bank of India (RBI) has tried to restrict domestic credit flow to this sector fearing a bubble. Calling India a prime example of “how investors gain exposure to an emerging market in the presence of capital controls", the report says the growth of different instruments such as financial derivatives-related and other transactions has opened several two-way channels for investors who want to reach India. The second of these channels is the participatory notes offered by registered foreign institutional investors (FII) or broking firms. Through these notes, foreign investors, including hedge funds, can get into the equities market even without having to register as an FII. FIIs buy equities of Indian firms and offer them in derivatives of different kinds. Of late, returns on Indian equities have been so high that the cost-benefit ratio works out well for foreign participants. Participatory notes have been the subject of a debate in the finance ministry as well as the 2006 report of the RBI committee on full capital convertibility. There have been proposals to ban it, fearing “unscrupulous elements misusing the facility", according to an equity market player who did not want to be named. The government has now made it easier for hedge funds to participate in the equity market. The third way is through the currency market. Onshore, the rupee forward market is only available for hedging commercial transactions. Foreign investors interested in an outright currency or interest rate view, can transact through the forwards and interest rate swaps markets, where liquidity is provided by foreign banks and Indian offshore accounts. The fourth way has helped Indian corporates to access foreign funds. Foreign currency convertible bonds are similarly repackaged into structured credit products, such as credit-linked notes and collateralized debt obligations. Indian subsidiaries abroad purchase the credit portion, while hedge funds, investment banks and other international investors pick up the option. Companies, the report says, prefer this option because it works out cheaper and easier than high-cost domestic funding and the dilution in equity is too minor to be worrisome. Also, says the report, the credit default market in India is relatively more active, as offshore subsidiaries of Indian banks provide the insurance to global investors, often through structured products.